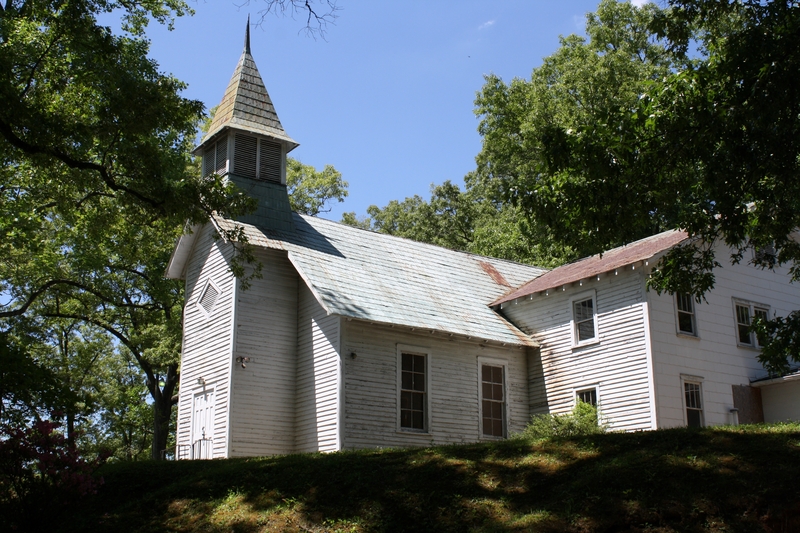 I have often wished I could go back in time to those shining Sunday mornings in the 50’s when Gene, Gary and I walked from our house on the Greenville Highway below Brevard to Carr’s Hill Baptist Church. Old Carr’s Hill Baptist Church. Building extant but no longer in use. 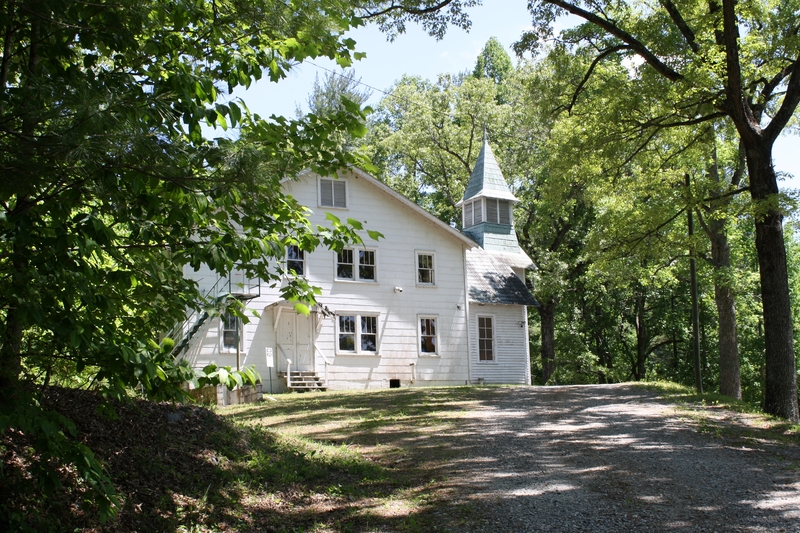 Present Carr’s Hill Baptist is south on Hwy. 276. What golden memories we made along that road. It was only a mile more or less. We walked up the highway (the best I remember it was gravel then) to Mr. Allison’s and then we took a little road on his property. I seem to remember it went between his barn and his cornfield. We came out on Becky Mountain Road. At that point we were almost there. There were cows in the pasture on our right, and a big corn field on our left. In the pasture was the loveliest creek you ever saw, and it flowed right down and under the road where we walked. Blue flowers grew alongside the creek in the spring. The clear water sparkled in the sunshine. We had a small creek at our house, but this one was bigger and better, and so, so beautiful. We never got enough of looking at it. We dared not climb down under the bridge and get into that clear cool water, but we sure wanted to! We nearly always stopped at the creek, hoping to see a fish. Our daddy was the best fisherman in Transylvania County, and that’s a true fact. But that belongs in another story. We could see the church fro m there as it was only a short distance away, up on the hill. They rang the bell a few minutes ahead of time to let you know to quit your lollygagging and come on in. Then at time for the service they rang it again, and you had better be inside by that time, or someone would hear about it. You could go all the way around the base of the hill and walk up the driveway, or if you wanted, you could take the trail up the hill for a short cut. My two oldest brothers and I went there for about three years. I will never forget the peal of the church bell, or the sound of the old fashioned piano. Most of the beautiful old songs I love to sing today I learned during those three years. And how stately were the processionals in Bible School with the big boys carrying the flags. I remember the pledges to the flags, the American flag, the Christian flag, and the pledge to the Bible, and the songs that went with each. We learned to sing “Lift Up Your Heads Oh Ye Gates” in Bible school. That time was so dear to me that I decided to paint the memory. I went down below Brevard to the place where Hogsed Creek runs under Becky Mountain Road and snapped a picture. The pasture is still there but it is nowhere near as pretty as it was back in the 50’s when I was a girl. I didn’t go up to the church, because it is no longer in use, and there is a house very near it. I reckon I was afraid someone would run me off. When I got into the painting, I had to skew things a bit to get everything I wanted into the scene, so it is not exactly a duplicate of the landscape, but very nearly. And, I couldn’t remember exactly what the church looked like. So I had to make that up. I found a photo of the old church on the internet tonight, and I was amazed at how similar the church in my painting is to the actual old building. Something in me remembered what my brain could not. That has happened to me before. I took another liberty with my painting by adding my youngest brother Vance on my right. He was too young to walk with us to church, but I didn’t have the heart to leave him out of the painting! Also, I did not recall there was a cemetery behind the old Carr’s Hill Baptist Church, but I put one in the painting anyway, just because old churches almost always have cemeteries. I read in the article I found this evening that there IS a cemetery behind the church. What about that! Hardly anybody rings a church bell any more. Some of the old, old churches in cities ring bells, but I never hear a church bell in the country any more. How my heart longs to hear again that clear, sweet call to worship!